Totalitny Rezim is an anti-all dada industrial noise collective. The group consist of Adolf Hypnotic Jagelsson, Artmiso Couchniere, I.v.Martinez & Johnny Johnanny. With their latest release on Sirona-Records they have worked with a few fieldrecordings, exchanging them among eachoter to gradually transform them into 10 intensive experimental tracks. 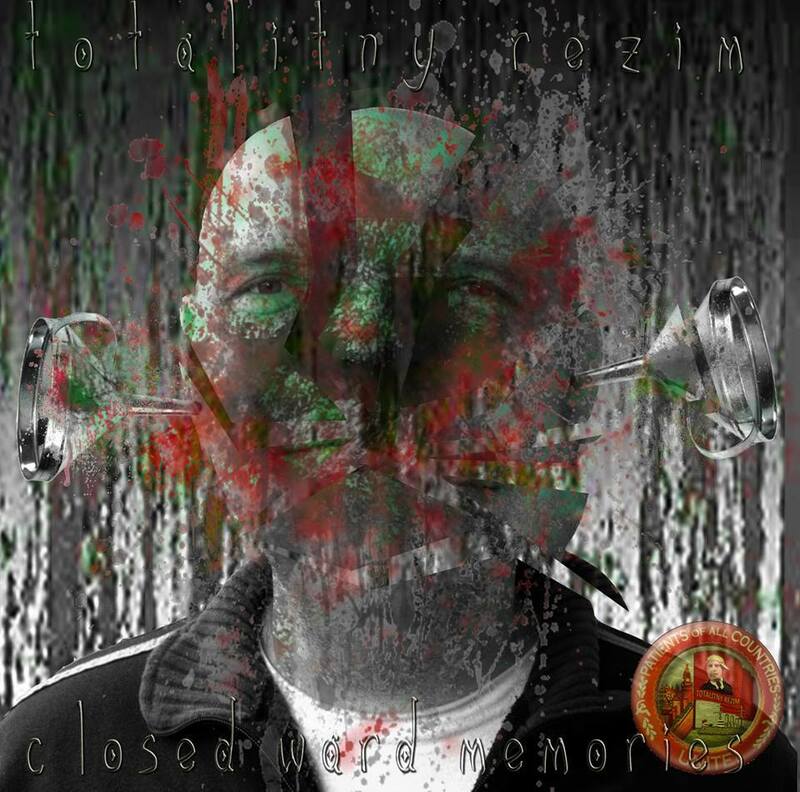 These tracks formed the content of their album that they kindly called ‘Closed ward mmemories.’ It comes with the interesting cover artwork that you can adore above this text. It looks like a friendly mugshot of the brother of hanibal lector being glitched and decorated with some nice splatters of blood. Let’s come with me and join this collective on their mental journey of closed ward memories. It starts with what we could have expected, but yet did not see it coming; the memories of a ‘closed ward.’ I don’t know if you have ever experienced being in that situation of being in a closed ward, but with a little imaginative mind it sounds exactly like this track. Think of the moaning voices in the head, and the nonstop bouncing and rocking against the walls. We would have slammed them with our hands, but as they are tightly confined in a straightjacket we just stamp our feet and wobble around like a mental humtpy dumpty. The almost ‘dance’ music that has been created over here, might be all just our insanity going wild, but sound wize it is an active fun track to jam your heads too! With ‘High as abyss’ the story continues. The voices in our heads bounce against the walls and are seemingly our best friends in this confinement. The sounds that we receive through the fantasy of these mind travelers are rhythmic and contrary what you might expect seeing the stains of blood of the front cover, actually quite enjoyable. I guess this proofs that even though society might lock you up, if your mind is free, nobody can oppress your own imagination or stop your creative mind making new worlds to survive the mess. With ‘Fodorko in’ we get treated with more amazing spacious rhytms that makes me believe that the closed warded inhabitants have stolen some pieces of cutlery and are getting a electronic shock treatment as a behavior adjustment. Everything floats in the room, that might have a roof but the music sets us so free that we can just ignore the walls and cement that they made to block the mind. The next track ‘Dmiish a jeho druzhina’ gives the listener a good impression how it is in the communual grounds of the closed wards. We should hear the other inhabitants, they chatter, we hear them using the drains, growling and brushing their teeth, but with our minds high on medication (that only seems to trigger our minds to be even more psychotic) things sounds incredibly different! The constant audio input is transforming in an amazing audioscape that makes us dance onto a complex base of excessive enjoyable weirdness. T.R. for fever is the fifth track on this spectacular sounding album that seems to captivate a cheerful out of mind episode of sound. This track on it’s own feels more seduced, as if we are injected with something to calm our brainwaves down from all our excitement. I believe that our caretakers couldn’t stand our smiling happy faces while being locked up in this special ward of mental memories. After being obviously heavily sedated on medication, the record goes forward with a tune called ‘Confused’. The effect of medications make way for an awesome mental fest of bombastic weirdness. We might be listening to the sound of being confused, but it sure is that we are happy and believe that this is an actual rave discotheque than an actual space in a mental hospital. If we can just take off that straightjacket, pull our shirts off and dance around naked while smeering poop all over the walls! Dance around with the ding dong out and about! We are not mentally insane, we are on the contrary quite brilliant! After our little happy whacko episode the story goes forward with the work called ‘Shontontoutron’. I geuss the guards have injected some kind of tranquilizer again, but it did not stop the mind from expanding their fortunate amazement of wild creativity. Strange sounds are disorientating the scenery and we love every minute of it. The track ‘Cverna z Cerna (T.R. ambient) brings another side of this memorable story. We hear the other hospitalized involuntary patients singing their hearts out in an pretty but disturbing bed of weirdness. It is obvious that the mind is distorted and everything we hear and see around us in this closed ward more a friction of the imagination feeded on a fraction of reality. Being intelligent enough to be aware of this the strange music is a joy of comfort considering our situation of illness. If we focus hard on these sounds we might actually escape this place. Back in our cell and sobered up and quite possibly a little bit clearer in the mind, we hear ‘Hellectronic musick’. The psychonautic abstractive sounds are turned into a really nice rhythmic soundscape that has a powerful pulse to it. Are we almost cured or energized enough to find a way out and open up this ward? The last track is the lengthy ‘Walk with T.R.’ and considering the story that we have been following over here, this might be the so called happy ending of our confinement. I’m not hundred percent sure as ofcourse we are all mentally insane, but it looks as if we have found our way out to freedom. Walking the lonely streets, hiding our multiple faces and mingle among the city people. At times we have flashbacks of the mental ward, or perhaps we are actually still there and is this ‘freedom walk’ all a part of the imagination going wild again? Let’s hope for the best and sniff the fresh air in the soft crunched environment. This entry was posted in audio collage, electronic, experimental, fieldrecording, glitch, IDM, noise, soundscape and tagged audio collage, experimental, industrial, noise, psychedelia, psychonautic, soundscape. Bookmark the permalink. These two recordings released on CS Industrial label giving insight into production of „Totalitný Režim”, which was released in the mid-nineties, were originally two sides of the same cassette tape. Among the recording of the particular blocks, however, the creators went not knowing where or why. In the space of almost 90 minutes the essence of every significant classic sound that defined the „Totalitný Režim” in this time is spread. Dada-anarchist apartment improvisations were recorded via built-in microphone of the tape recorder without the use of musical instruments. In this way anything could become the part of the current e. g. a scratching of random LPs, a stub of some broadcast or a recording of a phone call to the hospital with the question of when it will be possible to pick up ketamine (a sedative used in veterinary treatment known for its euphoric effects).